Want the flavor of barbecued sandwiches, but don't want to get the grill out or turn on the oven? Fix this slow-cook version. Combine all ingredients except buns in a 4-quart slow-cooker; cook, covered, on high for 5-6 hours, until very tender. 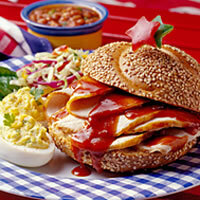 Drain and slice or shred pork; serve on buns with additional barbecue sauce, if desired. Serving Suggestion: Great with coleslaw, baked beans, and fresh fruit salad.